You should already have met the internal components of the computer and the peripherals, that sit outside. We are now going to look at two different categories of peripherals. Those that input data into a computer, and those that output data from the computer. How do we tell what is an input and what is an output device? Think about it from the computer's perspective. If a device is putting data into the computer in the form of text, sound, images, button presses etc. then it is an input device, if the device is outputting things from the computer such as sound, movement, printing, images etc., then it is an output device. It really is that easy to tell the difference, but be warned, some devices can be both input and output! 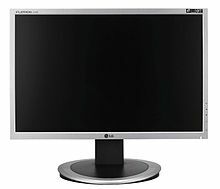 When you are using the monitor it displays things that you are doing, such as moving windows and clicking on website links. At no point do you click on the screen or put anything into the monitor. The only thing it does is output information, therefore it is an output device. Easy! A mouse is used to move a little cursor around the screen, clicking and dragging as you go. if you let go of the mouse, the cursor will stop. The computer is relying on you to move the mouse, the mouse won't move on its own! Therefore it is an input device. This page was last edited on 4 February 2018, at 17:32.